You are here: Home / Our Blog / Helpful Resources / What Is A Foreclosure And How Does It Work? 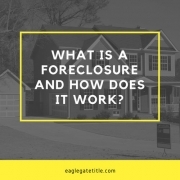 Certainly you have heard of a foreclosure, but what exactly is it and how does it really work? Purchasing a foreclosure can be beneficial in that they have a reputation for being one of the most inexpensive ways of acquiring a home. There are many misconceptions surrounding St George foreclosures, however. Many people assume that dumping these homes is something banks are desperate to do, which is not the case. St George foreclosures, or any foreclosure for that matter, rarely meet the ideal scenario that folks often wish for. Homes that have been foreclosed on are properties that once belonged to a homeowner but now belong to a bank. St George foreclosures can be the result of a few different actions by the original owner such as home abandonment or simply giving the deed to the bank willfully. There are many people who mistakenly say that the bank “takes the home back”. This is technically not correct because the bank never legally owned these homes. In these situations, it’s actually the mortgage (or trust deed) that is foreclosed on by the bank, not the home. The correctly terminology is that the bank seized the home. There are a lot of reasons, mostly life events, that can cause St George foreclosures such as unaffordable maintenance issues, relocation due to job transfer, divorce or marital difficulties, towering debt, health issues that prevent working, job lay offs, and market crashes. There are some things that you should consider if you’re thinking about approaching a homeowner who wants to foreclose. One is that each state has their own foreclosure proceedings so make sure that you are familiar with Utah laws concerning St George foreclosures. Another is that in many cases it’s preferable to buy the property before it has officially been foreclosed on. Consult a real estate lawyer to help you understand the particular risks and realities of the particular foreclosed St George home that you’re interested in. Another way to acquire a St George foreclosure is by attending the trustee’s sale and buying a home there. If this is the route that you’re interested in taking, be sure to first locate your local county office and check with them to learn the proper proceedings at these events and how to handle the sale. In most states, the buyer must heed certain rules such as you must purchase the property as is, you may have to pay a large earnest money deposit as well as show proof of financial adequacy, all bids typically must be sealed, and there are almost never contingencies on loans. Sometimes buyers choose to buy St George foreclosures “sight unseen”, meaning they’ve never actually seen the home before. This is obviously risky but is still a method by which St George foreclosures are purchased. In any scenario involving the purchase of a foreclosure, the buyer must be sure to find out if the property has any liens recorded against it. That is a problem that you likely do not want to inherit. There are methods of making sure something like this doesn’t happen, such as paying for title searches before the trustee sale takes place which allows the seller to enter the arena (so to speak) with insider information. Finally, a person can choose to buy a St George foreclosure from a bank. Know that if you intend to go this route, not every bank directly sells homes to investors. Some banks prefer to sell St George foreclosures in bulk rather than individually, or vice versa. You’ll need to find out the processes and preferences of the bank you’re planning on working with. 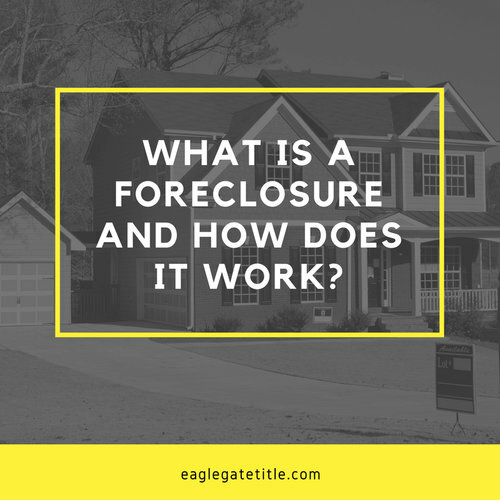 Individual foreclosure sales are typically done with the assistance of a real estate agent, many of whom specialize in these types of listings. http://eaglegatetitle.com/wp-content/uploads/2019/02/st-george-foreclosures.jpg 500 500 aloha http://eaglegatetitle.com/wp-content/uploads/2019/02/logo-300x212.png aloha2019-02-26 16:56:492019-02-27 19:36:17What Is A Foreclosure And How Does It Work?